I just couldn’t wait any longer to crack open my first pint of peaches I canned last week. 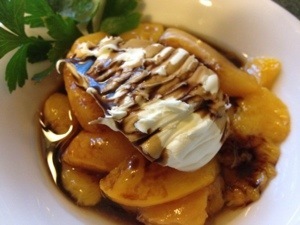 I treated myself to a simple dish of peaches, aged balsamic and a dollop of mascarpone. I really love peaches…I think I’m going to have to can more to get me through the winter. This summer we were having dinner at Fiamma Steak on Hertel Avenue in Buffalo and had the most delicious grilled pound cake with berries. I love trying new things and then figuring out how to make them myself. Face it — there are no real new ideas, just variations on a theme. Take pound cake, for example. 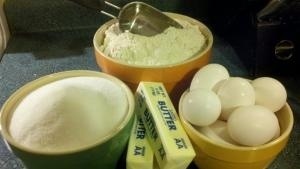 Pound cake is pound of butter, sugar, eggs and flour. Add 1 teaspoon of vanilla and ½ teaspoon of salt and you’ve got yourself a classic treat. I did some research about pound cake and have come to realize that while pound cake is a cake made with a 1:1:1:1 ratio it is also a generic phrase for dense cake like martini is a classic cocktail made with gin and vermouth or a drink served in a cone shaped stemmed glass. Be sure to have the butter and eggs at room temperature. Cold, hard butter does not cream well and cold eggs slow the cooking time down causing the cake to be overcooked on the outside and uncooked inside. I learned this one the hard way. 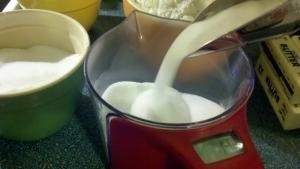 Use a scale to measure the flour and the sugar. Cooking is an art (a little of this and a little of that) and baking is a science. Exact measurements make a difference in baking. If even one ratio is off you will end up with something different than intended. While the cake is baking make the sautéed peaches and ricotta cream. In a heavy skillet on medium heat add butter and blood orange olive oil. Add peaches cook for about three minutes stirring occasionally. 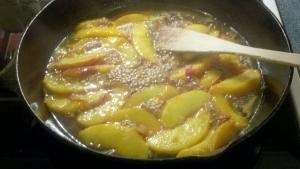 Add peach white balsamic vinegar, vanilla salt and brown sugar and cook until sugar mixture begins to darken. Watch very carefully because it goes from dark to burnt in just a few seconds. Set aside to cool. Whip on highest speed until peaks form and looks dry. Heat stove top grill and brush with butter. Slice pound cake and brush with Blood Orange Olive Oil. Grill both sides until caramelized grill lines form on cake (a few minutes on each side). Place on serving platter. Top each piece with peaches and ricotta cream. Enjoy! To save a great deal of time, my BFF Sara Lee makes a great pound cake (although you cannot infuse it with peaches). While it is defrosting make the peaches and cream and assemble. Give this a try and let me know how it turned out. If you have a twist, please share. Be sure to Retweet this or share it with your friends on Facebook so they can join the fun. Please join me at the Lewiston Kiwanis Annual Peach Festival http://www.lewistonkiwanis.org/ncpf.html and the 5K Run/1Mile Walk Saturday morning benefiting the It Happened to Alexa Foundation. There is always something happening Below the Falls! In blender or food processor, grind almonds, biscotti, sugar and ginger into crumbs. Melt butter and toss with until well coated. Press into bottom and sides of a tart pan or spring form pan with removable bottom. Bake at 350 8 minutes until brown and crisp. Cool. Peel scrubbed peaches (boil about one minute; remove from water; cool until you can touch then easily peel skin from peach) and cut into even sized wedges. Place in bowl with ½ cup Balsamic Vinegar and let soak until filling is spread on tart. Beat cream cheese, sugar, vanilla and almond extracts until soft and smooth. Spread gently over the cooled crust. 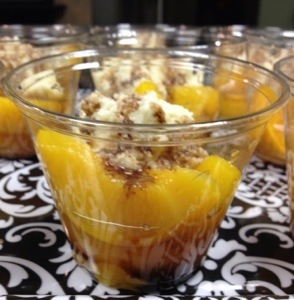 Either in a pattern or randomly, place drained peaches on top of cream cheese filling. Place all glaze ingredients in a medium saucepan and cook on medium-low, stirring almost constantly, until it boils for 1-2 minutes. Remove from heat and drizzle over peaches.